As a Burtonian ‘born and bred’, I was dumbfounded at the sheer scale of Burton Abbey which occupied a 14 acre site. I remain amazed that I could have lived in Burton for 50 years before discovering that such a structure ever existed. What I had always known as the Abbey (now the Winery) was in fact, a relatively small annex which spent at least some of its time as an infirmary. The complete Abbey in fact extended to include all of what is now the Market Hall and Saint Modwen’s church. 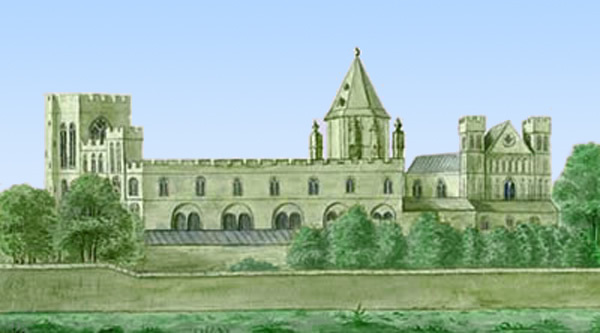 The above picture shows the best known reproduced image of Burton Abbey at its most impressive. It is my colourization of a 1661 engraving by W. Hollar that appears in numerous sources and can be found on a plaque of the outside wall of the Coopers Shopping Centre close to the ‘Market Entrance’.